The bombs used to attack the Boston Marathon appear to have been packed with shrapnel into pressure cookers, according to the FBI. 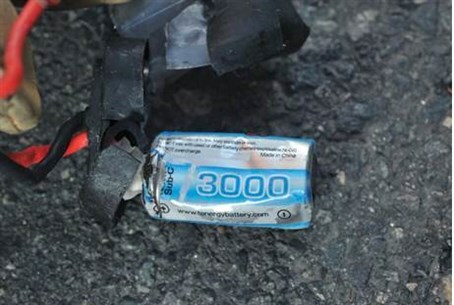 The explosive devices used by the terrorists who attacked the Boston Marathon appear to have been packed with shrapnel into pressure cookers, according to the FBI. Both were sealed into the metal cooking pots together with items such as sharp nails and ball bearings and then concealed in black duffle bags or backpacks. Doctors reported pulling nails from the body of a little girl, and “bee-bees” or ball bearings peppered throughout the bodies of others. Three people were killed and 183 others were injured when the two bombs exploded about 10 seconds apart Monday as marathon runners crossed the finish line in the heart of Boston. The twin explosions shattered glass, rocked buildings and sent both marathon runners and their friends and families flying, in many cases tearing off limbs in the process. President Shimon Peres and Prime Minister Binyamin Netanyahu on Tuesday evening expressed Israel's condolences to the American nation during the annual reception for foreign diplomats and consular staff on Israel's 65th Independence Day. Boston Police Commissioner Edward Davis said authorities had received no specific intelligence about any possible attack at the race. Moreover, two security sweeps of the route had been carried out prior to the start of the marathon. A $50,000 reward has been offered by the Boston police and firefighters’ unions for information leading to the arrest of those responsible for the attack. The IEDs (incendiary explosive devices) were built in a style that is typical of the international Al Qaeda terrorist organization. In fact, Al Qaeda years ago posted a “how to do it” manual on a jihadist Internet site, a point made public Tuesday afternoon in a news conference held in Boston by FBI officials. Such bombs have been used before in Mumbai, Pakistan, Afghanistan and elsewhere around the world. The Pakistan Taliban has denied responsibility for the attack. But by noon Tuesday, Deslauriers said, the FBI had already received at least 2,000 tips on possible suspects. A security source told CBS News that investigators had found pieces of an electronic circuit board, which might indicate a timer used to detonate a bomb. Or it could mean nothing. Investigators have already recovered the pieces of the black nylon backpacks and the pressure cookers, Deslauriers told reporters – but the FBI has yet to figure out how the bombs were detonated. According to the source, the bombs were made to appear as if they were “discarded property,” and it is not yet clear whether they were planted in garbage cans or on the sidewalk.